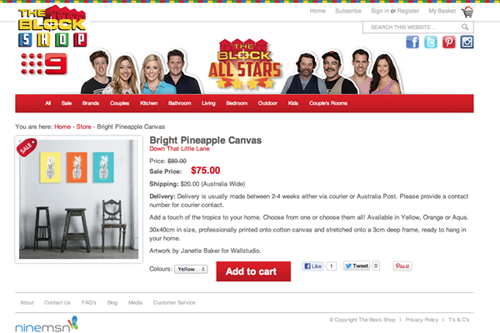 We are huge fans of the Channel 9 TV show The Block. This year's All Stars Series started a couple of weeks ago and is proving to be the best season yet! Not only are the all star contestants super talented and creating amazing rooms, but the show has become so much more interactive with its audience. Live Tweets are streamed on-screen as the show airs, but the best part is, you can now buy many of the items from the contestant's rooms through The Block Shop! We are super excited to finally announce [we couldn't keep it in any longer] that Wallstudio is available through our great friends Down That Little Lane on The Block Shop! So why don't you head to The Block Shop and check out all the amazing items for sale there and keep an eye out on the show to see the amazing rooms the contestants create!